I love the seemingly endless flavors Glico pumps Pocky out in. No matter how many of them I try, there is always something new and different. 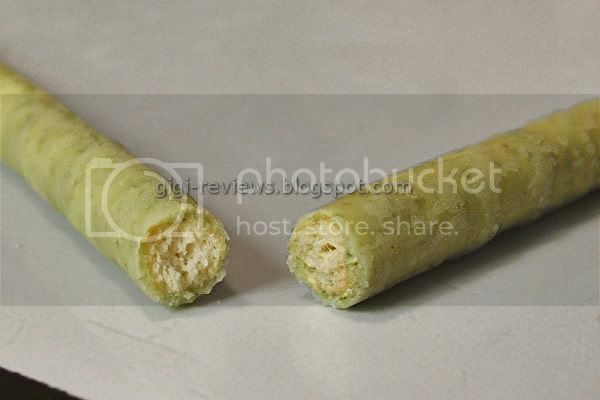 I came across these kiwi Pockys on my last trip to New York City. I had seen them on J-List that same day, and was lucky enough that they pretty much fell into my lap while walking through Kam Man Foods on Canal Street. These Pocky have the classic biscuit coated in what I am assuming is white chocolate (the label is in Japanese, so I can't be sure). The chocolate coating is a greenish shade that is indeed the perfect color match to an actual kiwi. The chocolate is also studded with little darker green bits -- bits of kiwi, I would assume. The smell was a little off-putting. It smells like sour melon -- or maybe kiwi left out in the sun too long. It's the kind of smell that makes you wonder if it's something you shouldn't eat. But then a weird thing happens...that same smell starts to smell good. Not sure how that happens, but it does. 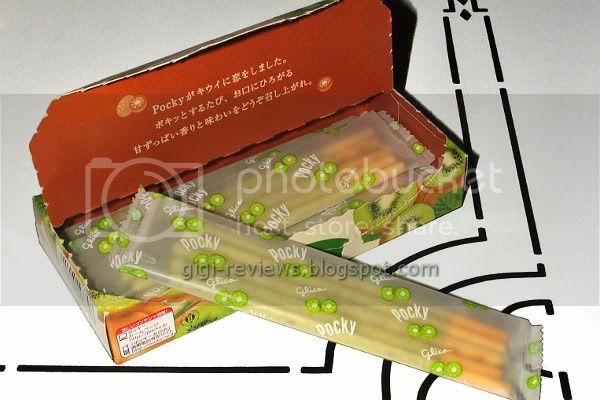 The Pocky in the box are divided into four individual pouches of five sticks each. Nice lunch box or Bento sized portion! I like when Pocky is packaged like this because it not only helps control portion size (OK, my self control is often not that strong, but it sounded good, right?) 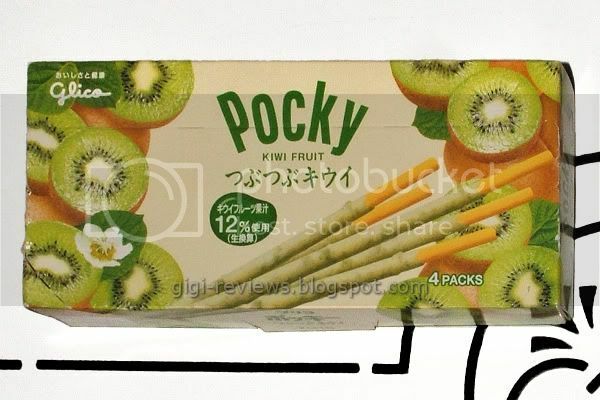 but it keeps the Pocky that you don't eat right away nice and fresh. We now know what it smells like and that it's fresh...so what does it taste like? Believe it or not, it tastes like real kiwi! I have never dipped pieces of actual kiwi in chocolate, but I have a feeling that if I did, it would taste pretty darn close to this. The fruit has that nice sweet, yet tart edge that kiwi has. (Yes, it does sort of taste like a cross between a strawberry and a banana -- just as kiwi does.). The white chocolate adds a nice milky contrast. The biscuit balances everything by keeping the sweetness of the fruit from being too much, and keeps the chocolate from overpowering the kiwi. It also adds a nice crunch. This may just be my favorite fruit flavored Pocky yet! 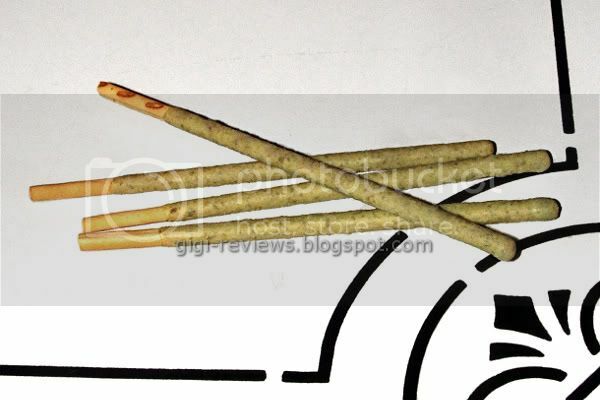 Be sure to check out Jim's review of them here. I purchased mine from Kam Man Foods in New York City, but my friends at J-List also carry it... so be sure to check them out!